In 1992, Amanda Boxtel suffered a vicious skiing accident that left her paralyzed from the waist down. Doctors said she would never walk again. This week, she proved them wrong, with the help of the world's first 3D printed exoskeleton that gives her the ability to climb out of her wheelchair and walk once again. The Ekso-Suit Amanda wears is fully bespoke. 3D Systems used data from a full body scan to print custom-tailored pieces that fit exactly to Amanda's body. Mechanical components from EksoBionics provide the automation, allowing Amanda to safely use her legs and a pair of canes to walk around. 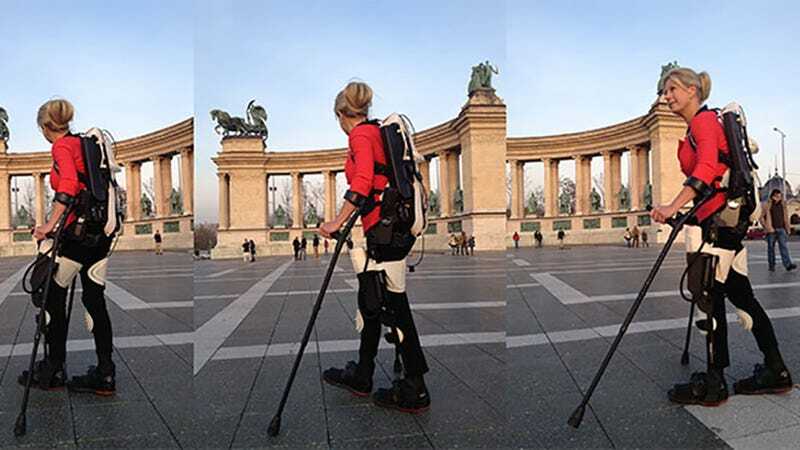 3D scanning and printing technologies were crucial to making Amanda's exoskeleton, which took roughly 3 months to complete. As Scott Summit, senior director for functional design at 3D Systems, told Cnet, "we had to be very specific with the design so we never had 3D-printed parts bumping into bony prominences, which can lead to abrasions." Since Amanda has no sensation in her legs, even tiny skin injuries can become dangerously infected before they're found. A comfortable fit isn't just a nicety, it's a safety necessity. This exoskeleton is the first to use 3D printing for an individualized fit, but it's not Amanda's first time using such technology: in 2010, she helped test an earlier exoskeleton design to help paralyzed patients walk again. Since then, she's been active as one of ten EksoBionics test pilots involved in the design process. Update: Commenter TJWebb points out that the top photo was taken at Heroes Square in Budapest. Pretty fitting location, I'd say.